Google changes its search algorithms approximately 500 to 600 times a year. Crazy, right? It’s not a bad thing, but keeping up can definitely be stress-inducing. Google is just continually adjusting its organic search results based on ever-changing user behaviors, and all we can do is keep a keen eye on our SEO strategies and optimize for changes unceasingly. One organic ranking factor that’s held strong as being one of the most essential is localization. Local SEO and search results are wildly important, especially for industries whose success is directly linked to location, like brick-and-mortar retailers, services, and dealerships, of course! So, is your dealership’s website optimized for local searches? Is it showing up in the local pack? Are you wondering what the heck the local pack even is? Keep reading. Google’s local pack is the list of three local businesses that appear at the top of the search engine results page, above organic search results. Google prioritizes local business, giving companies both small and large the chance to reach local audiences, despite high competition from online businesses. The local pack listings can show all sorts of valuable information about a business, including website links, star ratings and reviews, contact information, images, directions, and other relevant information. A map also appears above the listings, which links directly to Google Maps and identifies the location of each business listed. 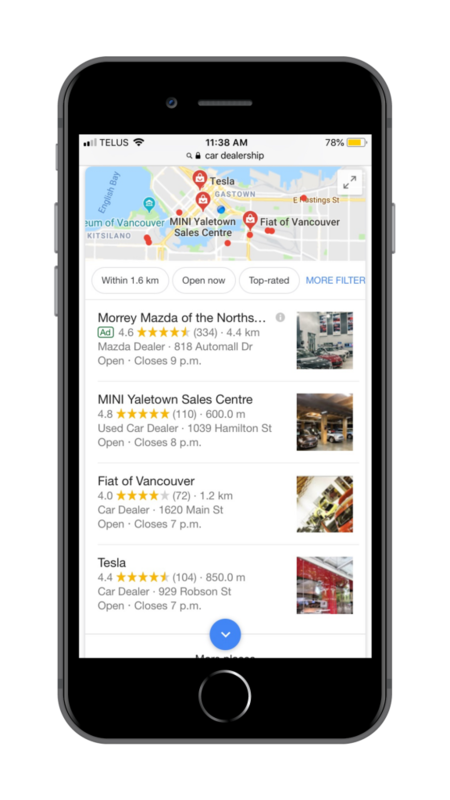 Google decreased the local pack from seven listings to three in order to show only the most relevant results and to better fit mobile screens. That means the competition for those spots is even more fierce than before. The 3-pack takes up an entire mobile screen in the search engine results page (SERP), too. Is your dealership showing up there? Only local, brick-and-mortar businesses are able to gain a spot here and showing up has massive opportunities for exposure. The visibility on both mobile and desktop is top-notch (literally). The local pack is location-dependent, so the listings will change depending on where the searcher is located. That means that you can’t always show up when you want to, but you can definitely optimize to increase your chances of showing up for nearby searches. Google uses relevance (how well a business listing matches a search query), distance (the proximity of a business to the searcher) and prominence (how reputable a business it) to determine local ranking. So, how do you gain a spot in the pack? We’ve compiled five ways that your dealership can optimize for local searches and win a spot in the local pack. Google My Business profiles are like a sandwich. The more you fill them with good stuff, the better they are. 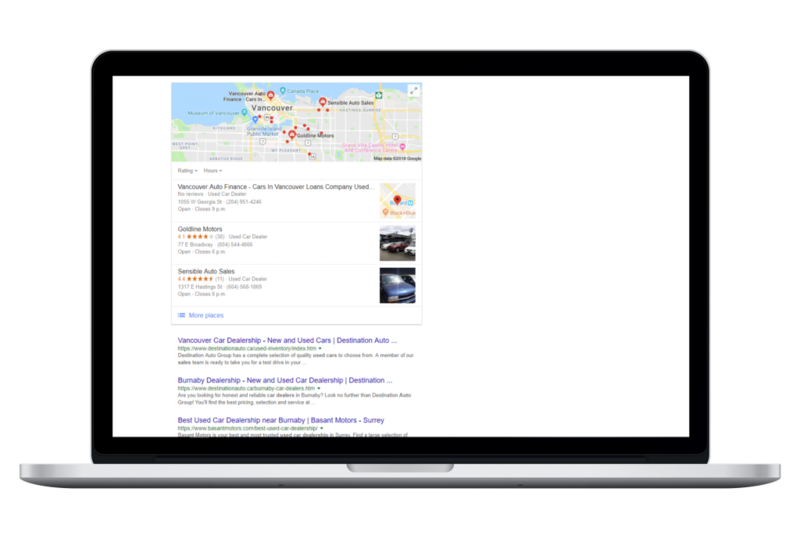 One way to improve your dealership’s chances of showing up in the local pack is to ensure that your Google My Business listings are accurate, up-to-date and complete. Include lots of high-resolution photos, too! Don’t worry, our Organic Search heroes maintain client GMB listings like it’s their job. 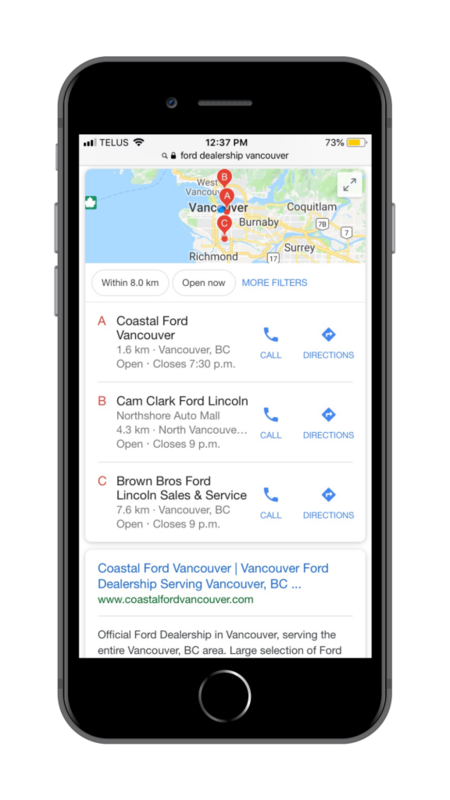 On top of having accurate information in your Google My Business profile, your dealership should also have accurate information across all other online platforms. That means having an updated NAP (name, address, phone number) anywhere you’re dealership is mentioned online. If Google begins wondering whether it’s got the correct contact information, your chances of landing a spot in the local pack decrease. Consistency is key! On average, consumers read seven reviews before trusting a business. Find creative ways to solicit reviews from your happy customers (perhaps avoid asking the cranky ones), and don’t be afraid to use a variety of review platforms (Google, Yelp, Facebook etc.) Also, just strive for outstanding service so your customers feel inclined to write online reviews without being prompted. This type of user-generated content does wonders for local SEO. Always. Just like strong SEO improves your rank in the search engine results page, it’ll improve your chances of landing a spot in the local pack. Be sure you’ve included all of the SEO musts: A strong title tag and meta description, H1 tags, image alt tags, keywords, relevant content, continuously updated pages, internal linking, fast page speeds and so on. Especially locally relevant links. Having your dealership appear in a variety of local listings and business directories will definitely increase your chances of winning a spot in Google’s local pack. Google uses prominence as a local ranking factor, meaning that it assesses how well-known a business is to determine its place in the local pack. Increasing the number of backlinks to your dealership’s website will prove to Google that you’re a prominent, reputable local business that deserves a place in the pack! Try sponsoring community events or hosting your own events to gain links in local media publications. Or consider showing your relationship with other businesses online to increase the number of links back to your own website. Check out some of Bright Local’s link-building tactics here. Optimize for local. Show up for the local 3-pack. It sounds so simple, but local SEO is a continuous process that jumps and shifts unpredictably as user behavior changes and Google rolls out its habitual updates. There’s no need to stress, though! Let our team of Organic Search experts help. We’ll work with your dealership to find ways in which we can optimize your website and online presence to land a spot in the local pack and show up for those local searches.